Ubuchasym de Baldach, Theatrum sanitatis, Ms. 4182, TAV. 205 , XIV sec. 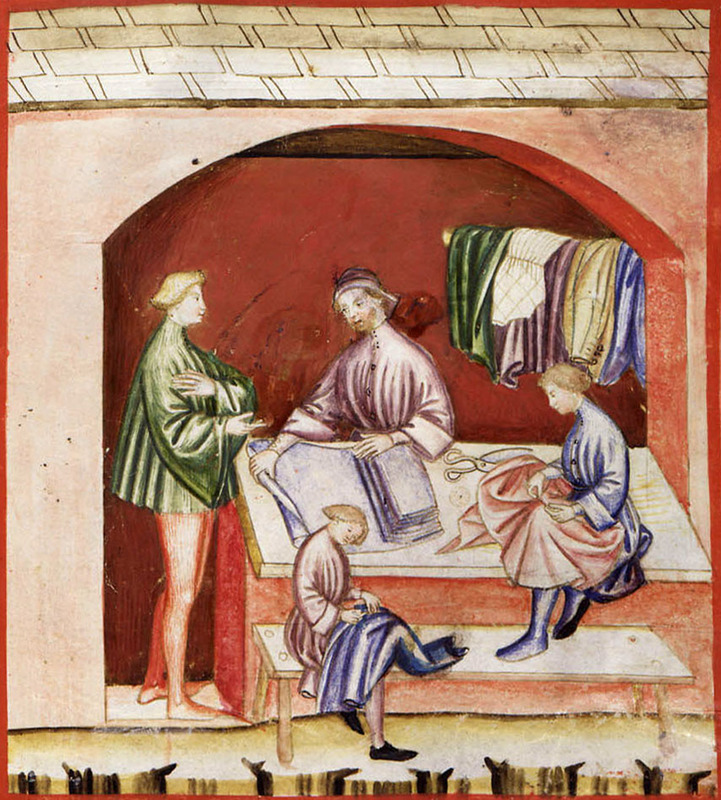 The study of the textile industry has always been central in economic history, from reconstructions of dynamic growth in the medieval wool industry, to the success of silk processing and light and mixed draperies in the early modern period, and the role of cotton as a driving force in the process of industrialization. Although the dynamics which characterize the manufacture of textiles are closely connected with transformations in fashion, economic history has long neglected the role played by fashion as a factor in economic change, treating fashion primarily as a sort of exogenous catalytic element. Yet even in the pre-industrial period, keen observers like Bernard Mandeville (1732: 132-3), the Anglo-Dutch philosopher and economic theorist, understood the fundamental mechanism in pointing to how social emulation at all levels of society promoted consumer behavior that stimulated the search for new materials, new industries, and the employment of labor. One of the first modern scholars to recognize the economic implications was Joan Thirsk (1973:50), who accused economic historians of ignoring evidence by relegating fashion to a secondary explanation in accounting for the development of the clothing industries. She too pointed out the power of the ‘tyranny of fashion’ on all social classes. Early scholarship distinguished between societies in which dress style was not subject to frequent cyclical change (called ‘costume’) and those in which rapid changes in clothing styles were the rule (called ‘fashion’). Interest in identifying when and why the ‘birth of fashion’ occurred has led to a variety of theories, the most persistent of which is that the early fourteenth century marked the introduction of innovations and constant changes in hairstyles, footwear and especially dress styles (Newton 1980; Steele 1999: 15-18; Wilson 2003: 18-20). Others put more stress on the ‘consumer revolution’ of the eighteenth century as a key factor in strengthening the elements of change in individual choice and marketing that affirmed the power of fashion (McKendrick et al 1982). More recently scholars have critiqued these efforts in arguing that fashion should be considered a global phenomenon that occurred in other places and (even earlier) times (Welters and Lillethun 2018). The object-centered approach of the material turn is also influencing research on fashion, particularly in terms of understanding the gendered body; how consumers viewed the sensory and material properties of fabrics, clothing, and dress accessories; and the relationship between the material-cultural practices of dress and the process of colonization. In other words, scholarship on fashion is undergoing a particularly fertile period of development, one that is ripe for the contributions of economic historians. These issues are at the centre of the Datini Study Week, which invites scholars to analyze the economic and commercial aspects of fashion in the pre-modern period (13th through 18th centuries) by considering the following questions. To what extent were innovations in products, technology, and marketing strategies for textiles and clothing during the pre-modern period responding to the social emulation and rapid pace of change characteristic of fashion? How did different types of consumers and behaviours stimulate the manufacture and trade in textiles, clothing, and dress accessories? Did particular price points or changing distributions of income allow consumers to make more choices about dress that supported individual aspirations? What role did cross-cultural contact play in the intensification of fashion in terms of the range of products available, new processes, and marketing strategies? How can economic historians draw on new methodologies and different types of sources for understanding the relationship between fashion and the economy? The Study Week will make a decisive contribution to our understanding of a fundamental transformation, the consequences of which project into contemporary society but matured in pre-industrial times: the economic power of fashion. Mandeville, B. The Fable of the Bees or Private Vices, Publick Benefits , London, 1732, vol. 1. McKendrick, N., J. Brewer and J.H. Plumb, The Birth of a Consumer Society. The Commercialization of Eighteenth-century England , London, 1982. Newton, S. M., Fashion in the Age of the Black Prince. A study of the years 1340-1365 , Woolbridge, 1980. Steele, V., Paris Fashion. A Cultural History, Oxford and New York , 1999. Thirsk, J., The Fantastical Folly of Fashion: the English Stocking Knitting Industry (1500-1700), in Textile History and Economic History: Essays in Honour of Miss Julia de Lacy Mann , eds., N.B. Harte and K.G. Ponting, Manchester, 1973. Welters, L. and A. Lillethun, Fashion in History: A Global View , London, 2018. Wilson, E., Adorned in Dreams. Fashion and Modernity (1st published 1985) rev. edition, New Brunswick, NJ, 2003.
b. What difference did social class make? The results of the research selected for the project will be presented and discussed at Prato in the course of the Study Week 2020. After the discussion at the Settimana sessions, scholars should complete and revise their texts by 30 June 2020. All contributions received by the Institute will be subject to anonymous adjudication before publication. .
Scholars are invited to send their proposal by compiling an abstract that will be reviewed by the Executive Committee. The paper should represent an original contribution and be either generally comparative or a specific case-study that speaks to the larger questions set out here. Papers proposed by projects or collaborative groups that link scholars from different countries and institutions will be assessed with particular interest if they offer a comparative analysis in geographical or diachronic terms across two or more related research themes. We will also consider innovative session formats for these type of proposals. The Executive Committee will only take fully completed formats into consideration and will decide whether they have been accepted at the beginning of 2019, when authors of the selected proposals will be notified. Depending on the Institute’s financial resources, at least 25 scholars will be provided with hospitality at Prato for the Study Week. The Council may also invite up to 20 additional scholars to participate in the project without any right to hospitality or reimbursement. The Fondazione Datini will award for the Prato conference up to 10 Travel Bursaries to cover travel costs for the conference to the maximum of 250 euros per grant for selected postgraduate doctoral students and postdoctoral scholars who do not hold a full-time academic position. Applicants must send the travel bursaries form to the Fondazione Datini with their paper by 30 April 2020. The grant will be paid during the conference on the presentation of travel receipts. The members of the Executive Committee are: Erik Aerts (Leuven, President), Laurence Fontaine (Paris, Vice-President), Giampiero Nigro (Florence, Scientific Director), Hilario Casado Alonso (Valladolid), Sergej Pavlovic Karpov (Moscow), Olga Katsiardi-Hering (Athens), Maryanne Kowaleski (New York), Paolo Malanima (Catanzaro), Michael North (Greifswald), Luciano Palermo (Roma), Gaetano Sabatini (Rome Tre). All submitted contributions must be original and not previously published or translated from previous publications. The provisional texts of the selected contributions or at least a detailed synthesis must reach the Fondazione Datini (Datini Foundation) by 30 April 2020. They will be put online (with protected access reserved for the participants of the project and members of the Scientific Committee) on the Institute’s webpages before the Study Week in order to allow a deeper discussion of their contents. Authors who fail to send their provisional texts to the Fondazione that day, can not be included in the final programme. At the Settimana participants will offer a summary presentation of their contribution lasting 20 minutes. In absence of the author the synthesis will be read during the conference. The definitive texts of the paper, revised by the authors following the discussion (maximum 60,000 characters) must be sent to the Institute by 30 June 2020. They will be subject to anonymous adjudication. Texts that pass the assessment stage will be published in a special volume (together with two abstracts, one in English, the other in Italian, French, Spanish or German, prepared by the author) within a year. For the purpose of publication, texts will be accepted in Italian, French, English, Spanish and German. Simultaneous translation from and to Italian and English will be available during the Study Week.